Trump showed he can play a president on TV Tuesday, but that’s it. 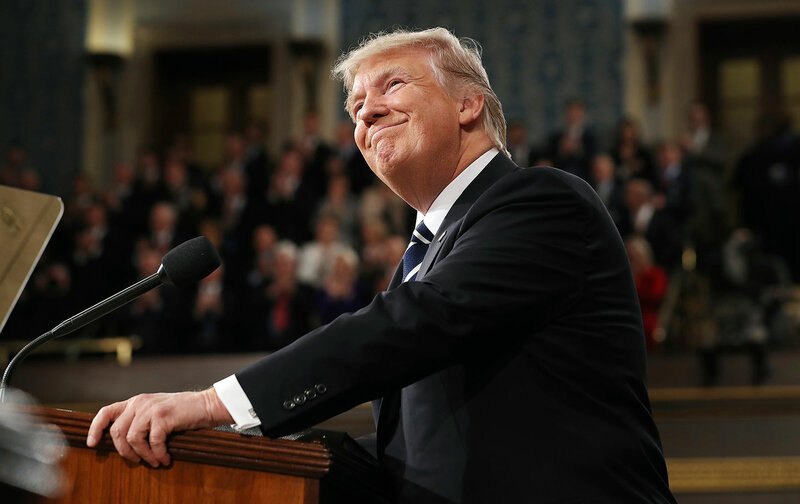 In his address to the joint session of Congress on Tuesday, Donald Trump showed he can play the role of president on television. He successfully read a long speech, using all the normal rituals—rhetorical optimism, calls for unity, big promises and small policies, tawdry use of heroes and casualties as props for applause. He received boffo reviews by exceeding low expectations. Snap polls showed viewers gave him high approval ratings. Van Jones, CNN’s progressive commentator, joined with Republican majority leader Mitch McConnell in applauding Trump as “presidential” for his egregious exploitation of a widow’s grief to defend her husband’s death in a bollixed mission in Yemen. Trump was tethered by his text, but still recycled the themes of his campaign stump speech. Once more he painted a dystopian picture—mass unemployment, “lawless chaos” in immigration, threat of a “beachhead of terrorism” in our country, an “imploding Obamacare disaster” and more. He trotted out the promises kept in the first 38 days. Never mind that these were mostly symbolic accomplishments: orders to review something, commissions to investigate, stunts to celebrate, a “great wall” to be built. Trump meant to confirm intention, not results. Once more Trump posed as a Merlin, able to summon miracles from the heavens. “Dying industries…roaring back to life” and “crumbling infrastructure” to be replaced with new structures “gleaming across our beautiful land.” He promised that “our terrible drug epidemic will” ultimately, stop” and that “neglected inner cities will see a rebirth.” Trump’s promised health-care reform will “expand choice, increase access, lower costs, and at the same time, provide better health care,” he claimed. “Everything that is broken in our country can be fixed. Every problem can be solved. And every hurting family can find healing, and hope,” Trump declared. But while extolling “healing and hope,” Trump preyed on division. In his telling on Tuesday, immigrants threaten jobs and violence. Muslims seek a “sanctuary for terrorists” in our country. “Criminal cartels” have spread “across our country.” Trump condemned “Radical Islamic terrorism,” ignoring the warning of his new national-security adviser that damning an entire religion only reinforces the terrorists. And the gulf between Trump’s promise and his policy is glaring. Trump promised good jobs—and offered corporate tax cuts, deregulation, and vague immigration reform as an answer. He promised fair trade, but offered no policy, except last rites on an already dead Trans-Pacific Partnership. His promise to label China as a currency manipulator is now a distant memory. He pledged to clean the swamp, but has handed his economic policy over to Goldman Sachs alums. He called for an infrastructure plan paid for by “public and private capital,” a signature Goldman Sachs gambit that should have taxpayers holding onto their wallets. Trump also brazenly purloined the applause lines of progressive Democrats. Fair trade, a $1 trillion plan to rebuild America, Buy America and Hire America, affordable health care, paid family leave, “accessible and affordable” childcare, investment in “women’s health, “protection of “clean air and clean water”—all garnered standing ovations from a Republican Congress that has obstructed progress on any of them, and is likely to do so again. In all Trump’s rhetoric, there was no mention of the pervasive waste, fraud, and abuse of a Pentagon that cannot even be audited. There was no call to meet the real and present dangers like catastrophic climate change that is already destabilizing regions. He railed against drugs flooding across our borders, but made no mention of the deadly opioid epidemic from drugs that come over the counter and out of the drug cabinets. The speech demonstrated that Trump can play a president on television. He can pose as a populist champion, promise the moon with a straight face, while peddling the same old conservative snake oil in new bottles.